December 8, 2015| Phnom Penh, Cambodia. The Religions for Peace (RfP) Asia & Pacific Interfaith Youth Network (APIYN) representing 50 multi-religious youth from 15 countries across the region have convened a three-days youth camp with the theme “Multireligios Youth Action to Overcome Violent and Non-Violent Religious Extremism” in Phnom Penh, Cambodia. The aim of the youth camp is to educate, train and mobilize religious youth leaders in the Asia-Pacific region to understand the issues and concerns of religious extremism and capacitate them to properly respond based on multi-religious common action. 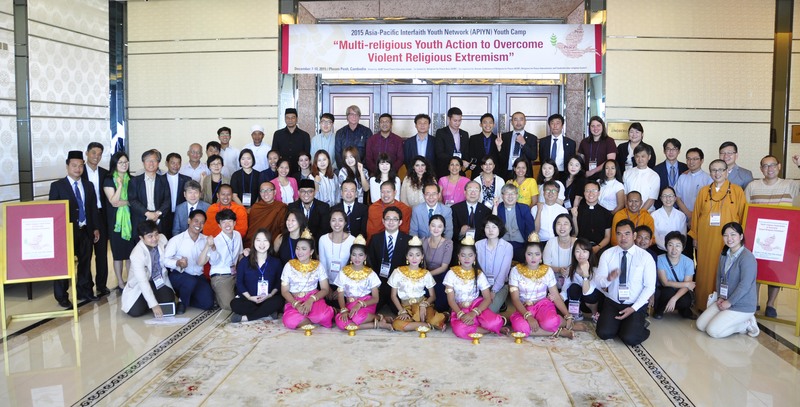 The youth camp was hosted by the Cambodia Interreligious Council and supported by the Religions for Peace International Global Interfaith Youth Network, Religions for Peace Asia and the ACRP Seoul Peace Education Center. His Holiness Ven. Tep Vong, the Grand Supreme Patriarch of Cambodia, has personally welcomed the youth delegates and religious leaders at the opening Ceremony. Rev. Sunggon Kim, President ACRP Seoul Peace Education Center, Rev. Yoshitaka Hatakeyama, ACRP Secretary General, Rev. Kyoichi Sugino, Deputy Secretary General of Religions for Peace International and senior religious leaders of the Korean Conference of Religions for Peace, Religions for Peace Japan and Cambodia Interreligious Council have graced the opening ceremony to inspire and support the youth leaders in Asia. The visit to the historical sites such the Royal Palace and the Silver Pagoda, Choeung Ek Killing Fields Memorial, the Wat Ounalum Temple and others have provided the youth leaders a deep sense of appreciation to Cambodia’s religion and culture. The youth delegates have also interacted with school children at Miraero school sharing their talents and teaching them about their respective national cultures.